KARACHI: Famous writer, satirist, and scriptwriter Anwar Maqsood has apologised for his Sindh centric ethnic skit after strong backlash and criticism from Sindhis. On his social media page ‘Anwarnama‘, the writer shared a small skit featuring himself and an imaginary character of Sindhi wadera. The skit showed the wadera talk about being lazy, doing nothing except taking loans from banks and declaring himself dead instead of returning those loans. The skit which aimed to show the mentality of Sindhi landlords, faced serious backlash from people across the country, especially from Sindhis, who called it offensive and racist. “Calling Sindhis lazy and corrupt is not funny, it’s spreading hate and maligning,” tweeted singer Ali Gul Pir. After much backlash, Maqsood issued an apology in a video message stating he was deeply worried after Sindhis got offended due one of his skits. “I am a Sindhi myself as my family came to Pakistan in 1948 in this province and staying here since then,” he said, adding that he does not belong to any political party but always had good relations with Benazir Bhutto, still has cordial ties with Asif Ali Zardari and PPP leader Nisar Khoro is his friend. “Sindh is the land of love and If anyone got hurt due to my skit, although it was a comedy work, I apologise from my Sindhi brothers who are just like my family,” the writer said. I know Anwar Maqsood since my teens. His sister Bajiya & Jalali gave me eternal fame. Why would she cast a Sindhi girl if they had biased against Sindhis? 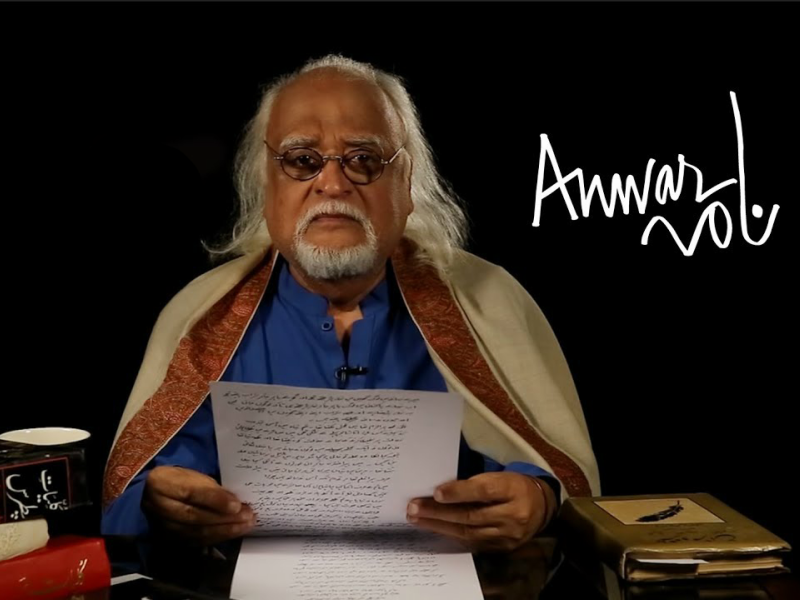 Anwar Maqsood thinks that he is very funny, which perhaps, he is! But he does not know where he is crossing the line (of decency). This happens when someone considers himself very superior! Easiest genre of humour is degrading others. Sad! Apology should not be accepted.